The Foyle Cup is an annual youth soccer tournament open to both boys’ and girls’ teams held in Co. Derry, Northern Ireland, since 1992, and DB Sports Tours are excited to promote the latest edition of the tournament. DB Sports Tours believe the Foyle Cup is the perfect showcase for a US based youth soccer team, with the competition set to take place in July 2019. With over 10,000 participants each year, The Foyle Cup is one of Ireland’s biggest youth football cup competitions globally. Indeed, over 400 teams from each corner of the world are expected to take part in this youth soccer tournament. This soccer competiton will be held in July 2019, and the complete soccer tour package will last a total of eight days (July 21 – 28). We have created a memorable and tourist centric Irish soccer tour to accompany the Foyle Cup. For seven nights your group will get to explore all the Green Isle has to offer, both Co. Derry in Northern Ireland, and briefly south of the border in the Republic of Ireland, spending one night in Dublin. Essentially however, this is a fantastic opportunity for a group to experience soccer in Ireland, with a vast swathe opponents from across the globe. There may be teams from all over competing in this youth soccer cup, but the Irish have often found success here. Indeed, in 2015 for example the Sligo and Leitrim Youth League side won the U-12 Foyle Cup. 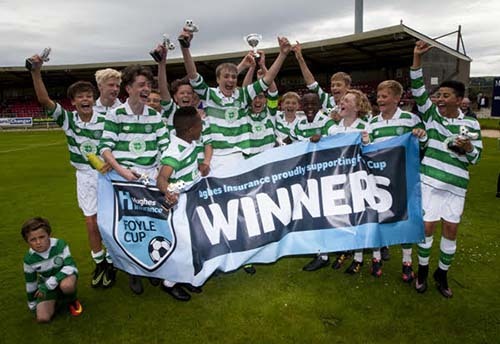 DB Sports Tours have long since been advocates for the Foyle Cup, and subsequently how much the youth tournament and accompanying Irish soccer trip can benefit US based soccer teams. Earlier this year we arranged for the Cooleyville Evolution to make the transatlantic trip to Ireland to take part in the Foyle Cup and experience a similar trip around Ireland. As previously mentioned, the Foyle Cup prides itself on its inclusivity; it hosts tournaments for both boys’ and girls’ teams of many ages. Girls teams of the following ages can register to compete at the Foyle Cup: U-9, U-11, U-13 & ladies’ born on or after Jan 2001). For boys there are nine age groups available: U-11, U-12, U-13, U-14, U-15, U-16, U-17 & U-19). Over the space of one week the group will take part in the Foyle Cup in Co. Derry, whilst getting to explore the city with a parade to commemorate the start of the tournament, as well as a walking tour of Derry City, and also a trip to the picturesque Giants Causewaya. Before the end of the trip the group will travel to Dublin, where they will go on a walking tour of Dublin City. All accommodation for this trip will be on a half-board basis, meaning breakfast and dinner, barring the last night in Dublin wherein you will eat out in the city. We have designed a payment plan which is customer focused; we want to make it as manageable as possible to make this trip of a lifetime a reality. It is broke down in four stages: deposit, payment two, payment 3, and final remaining payment. The price for this trip is dependent on the size of your group. It is as follows: $1,999PP for a group of 20-29, $1,749 for a group of 30-39, and $1,599 for a group of 40+. Should anyone prefer a single / double / twin rooms with regard to accommodation then a charge of $80 per night will apply. The prices do not take into account flights.